This is my own homemade pork which I made from pork skin and some meat too. My family love it more than commercial ones because it's made with more meat and not just fat and skin. They can be assured also that it's clean, properly dried and cooked. More often I don't dry the skin outside, I just let it boil in water, salt and spices and wait until tender then I fry it. When it's fully cooked and has a light brown color already I sprinkle cold water on it. For what? 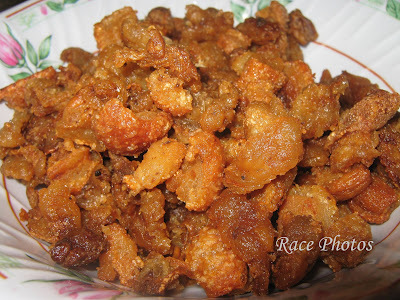 To make it crunchy and to be a real chicharon. Now even if I cooked a kilo or two of this delectable food it's always not enough for us lol! Click the badges above and see other yummy foods! Sounds like a big hit in your family! That looks crunchy. It's always good when you cook your own food because you can assure the cleanliness of your food and can control the taste of it too. Visiting via FTF! i have heard of sprinkling cold water on the meat/skin to make it crunchier, but have never actually seen it being done. do the oil splatter all over? parang nakakatakot, hehehe. yummy; thanks for sharing your techgnique to make it even more crunchy :-)!